Never mind 'hug-a-hoodie' - some Conservatives would like more hugs from the leader themselves. Gary Gibbon continues his #asktheleaders profiles with a look at David Cameron's relationship with his party. 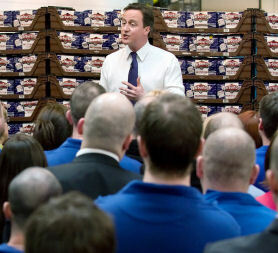 The Conservatives have made David Cameron the face of their campaign. For years his personal ratings were higher than those of his party. But in recent months they have begun to slide. Are voters having last minute doubts? When elected Conservative leader back in 2005 Cameron set a simple criterion by which to judge his leadership skills - the transformation of his party. His aim was to bring in more female, black and gay MPs - to make the parliamentary Conservative party look more like the country it sought to represent. Has he succeeded? Shaun Bailey, Conservative candidate in Hammersmith and Shepherd's Bush, certainly thinks so. "David Cameron showed that not only did he have the gusto and the plan, he's been effective, he's fundamentally changed who we are, what we do and how we react to a given problem," he says. "I've watched the number of black people, the number of Asian people, the number of handicapped people, the number of women, change, in the Party, there's more and more and more." - David Cameron: 21st old Etonian PM? The statistics, to a degree, support him. According to the ConservativeHome website, if the Conservatives win an overall majority of one, the number of Conservative MPs from ethnic minorities will increase from 2 to around 12, while the number of women will increase from 18 to more than 60. There's even a lesbian. But the site's editor Tim Montgomerie points out this is, in part, the result of fierce pressure from Conservative Central Office. "There was a priority list," he says, "which associations were supposed to pick from, that had 50 per cent women, 10 per cent ethnic minorities. "They tried encouragement, cajoling, there were calls from central office to association chairmen ... The Conservative Party under David Cameron has done everything short of compelling the local associations to choose a certain candidate." Even so, close to a fifth of Tory MPs in the next parliament are likely to be white, middle class men. And there could still be as many as 21 Old Etonians in the parliamentary Conservative party. But a more serious question for Cameron is the degree to which he has managed to hold the party together while forcing through change. "I think there are two sides to leadership," says Brian Binley, MP for Northampton South, and one of the few prepared to voice any criticism at all at this stage. "The first is pointing the way to the sound of gunfire, of being inspirational …. The other side of the coin is shedding a tear of sympathy, putting your arm around a colleague if things aren't going too well; I think that there's an element of David that needs to come across more." Some in the party have been left disoriented by its transformation. Many more are angry over Cameron's brutal handling of the expenses crisis, when he effectively sacrificed a number of Conservative MPs. Their anger is exacerbated by Cameron's far gentler handling of Lord Ashcroft's tax status, which they felt revealed double standards. "In the end, we've answered all the questions that people have been asking about Lord Ashcroft, and that's been sorted and done," says Cameron in his own defence. But his most serious problem concerns the party's core message. Back in 2005-2006 he delivered an upbeat, optimistic message, promising to "share the proceeds of growth." Then the bank crisis struck and he had to adapt quite suddenly to an age of austerity. "One of the big challenges in opposition is you are always adapting to outside circumstances, whether it's changes in society, or the economy," says Cameron. "How you respond to events is a very key part of leading your party effectively. I don't think it involved a wholesale strategic change because in my leadership election I spoke about the importance of a strong society, of a dynamic economy and those two things remain." Shadow Chancellor George Osborne, takes the same view. "I think our message at this election is fundamentally optimistic, and David is a fundamenally optimistic person. And he was an optimist in good times but he is an also an optimist when things are not so easy," he says. Whether the electorate is able to detect a consistent Conservative message remains to be seen. David Cameron: 21st old Etonian PM?